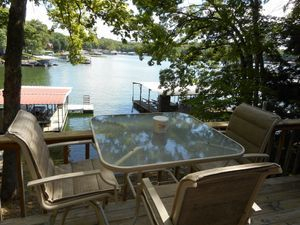 "Premier Vacations at Lake of the Ozarks"
We have the very best vacation rental homes at Lake of the Ozarks! We can accommodate your family reunion, Corporate Meeting get-away, wedding or just a couple's romantic weekend. Browse our available properties. You can (review pricing), (read online reviews) from previous guests, and request reservations. If you have questions about any property, or have an interest in us managing your home, please be sure to contact us! "View Vacation Rentals Available Below"
Smaller group or want more privacy? Located lakefront and in Sunrise Beach, you will enjoy this charming two bedroom cottage, complete with wooden swing on the trees in front of it. Each bedroom has a queen bed, and the bathroom has a shower. Nothing between it and the lake but a lot of grass, and a terrific deck to enjoy the view from. A slip in your private dock awaits you. Experience one of the best views on the lake. Located on the 7 MM of the main channel, on the west (best) side of the lake, you are in an ideal location with access to numerous restaurants, both on or off the lake. From here, you're just 10 to 15 minutes away from fantastic restaurants, great shopping, golf, and lots of activities for the kids, including go-karts and movies. 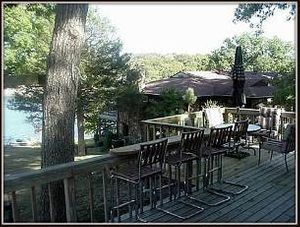 After you've spent the day experiencing all that the Lake of the Ozarks has to offer, you'll have your own private cottage to retreat to for the night. This home has 2 bedrooms, one bath and can sleep 4-5. The home has cable and WiFi, large deck and private dock. Coconuts 3 Bedroom Home "Coral Reef"
Coconuts 3 Bedroom Home is a wonderful 3 Bedroom 1250 sq ft home for your family vacation, golf outing or fishing. Coconuts is located on the 7MM on the Gravois Arm . During your stay at Coconuts, you'll enjoy 2 queen size rooms and a room with twin beds for the kids. Add the roll away for one more spot. 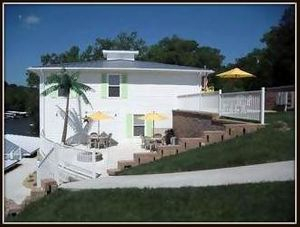 Coconuts 3 Bedroom Home "Turquoise Bay"
Coconuts 3 Bedroom Home "Key Lime"
Coconuts 3 Bedroom Home is a wonderful 3 Bedroom 1400 sq ft home for your family vacation, golf outing or fishing. Coconuts is located on the 7MM on the Gravois Arm. During your stay at Coconuts, you'll enjoy 2 queen size rooms and a queen suite with a private bath. 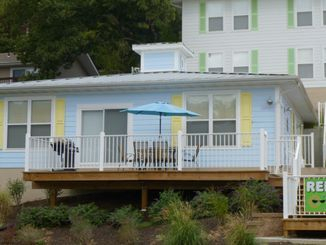 Located in Gravois Mills directly across the cove from Coconuts Beach Bar & Resort, this home has everything. Walk in the front door to the upper level with 2 bedrooms and a full bath. Step down to the main level with windows that allow you a great lakefront view. 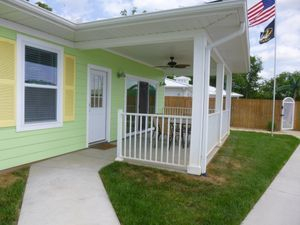 You will find the living, dining rooms and kitchen along with the master bedroom and full bath. The kitchen is fully equipped and a gas grill sits on the full deck above your private dock. Coconuts 7 Bedroom Home "White Sands"
Coconuts 7 Bedroom Home is a wonderful 7 Bedroom home for your family vacation, golf outing or fishing. Coconuts is located on the 7MM on the Gravois Arm. During your stay at Coconuts, you'll enjoy 2 king, 4 queen size rooms, while the kids play in the 6 bed bunk room.